Ocean Breeze West, the affordable condo directly on the gulf, is perfect for those who enjoy small complexes. The building has 47 units with a Gulf front swimming pool and a large sun deck. This condo has 980 SF of living area and Gulf Front balcony access from the Living Room and Master Bedroom. Ceramic Tile in Foyer, Living Room, Dining Room, Kitchen and Baths with Carpeted Bedrooms. Electronics include 55" TV, DVD in Living Room, 40" TV, DVD in Master Bedroom and 32" TV, DVD in Guest Bedroom. Wonderful teacher moms spring break! Plan on coming back next year...for our 3rd annual!! 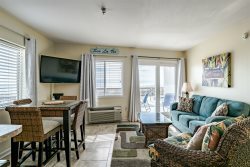 Perdido Realty is the best resource for a rental in this area. I always get great customer service, too! We had a light out in the hallway and the living room DVD player did not work when we arrived late Saturday evening. I called on Monday morning and a man came out that afternoon to look at both items. He did change out the lightbulbs and looked at the DVD player, but said he would have to get back with the office and/or owner to get the player replaced. Around 9am on Tuesday, a woman came with a new DVD player and installed it seamlessly. She was awesome! That night we were able to start our vacation movie viewing marathon! Our condo was extremely nice and had excellent views of the ocean. If back in the area would definitely wanna stay at Ocean Breeze West again and possibly even the same condo. Thank you for making our family vacation a memorable one. The property was very clean and well maintained. Our unit was exceptionally clean and comfortable. I look forward to a return visit. The lady that works on Sunday by herself is amazing! Great value and beautiful scenery. Ocean Breeze West 603 was nice, clean and well decorated! We highly recommend Perdido Realty and Amber who arranged our stay.